June Jones was named coach of the year today by the Western Athletic Conference. 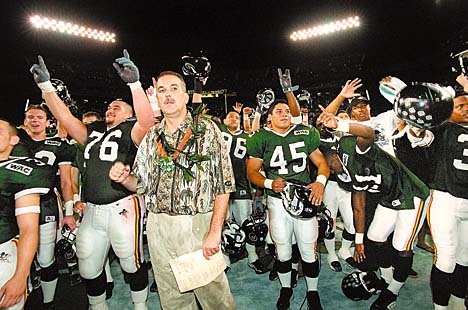 In his first year as the Hawaii head coach, Jones took a program that finished 0-12 last season and led it to a conference co-championship and its third postseason appearance in 11 seasons. "It's nice if you win something like this, but you certainly don't go into a season expecting it," Jones said. "What makes a season like this special is seeing the faces of the players, especially our seniors. They have been through so much, it's satisfying for me to play a part in this turnaround." Several of his seniors contributed to the Rainbows' eight-game swing that equaled an NCAA record for the best turnaround. Middle linebacker Jeff Ulbrich topped the list of Rainbows named to the first team on defense. The 6-foot-1, 243-pound senior led the WAC in tackles with 169, including eight quarterback sacks. He broke UH's single-season record of 148 tackles set by Tim Buchanan in 1968. "Jeff has been the heart and soul of our defense," Jones said. "He's deserving of any award given to him." Cornerback Quincy LeJay joins Ulbrich on the first-team defensive unit. LeJay led the league in interceptions with seven, including returning three for touchdowns. "This is the kind of season you dream about as a defensive back," said LeJay, who wasn't listed as a starter during parts of fall camp. "The individual awards are great, but it doesn't compare to what we did as a team this season." On offense, the 'Bows placed three players on the first team. Dwight Carter, a Los Angeles-area standout, heads the UH contingent at wide receiver. He led the WAC in receptions with 77 and yards with 1,253, and tied UTEP wide receiver Lee Mays in touchdowns with nine. Also named were offensive tackles Kaulana Noa and Adrian Klemm. Noa started 48 consecutive games at right tackle and Klemm anchored the left tackle spot. Hawaii yielded only 24 sacks, not bad considering senior Dan Robinson attempted a school-record 556 passes. Jones thought Robinson should have been named first team at quarterback, but that honor went to Fresno State's Billy Volek. The Rainbows landed several players on the second team, including Robinson. They were defensive lineman Matt Paul and punter Chad Shrout. Hawaii's Jamal Garland was also named to the first team as a return specialist. Pos. Name			School		Ht. Wt. Yr.
WR 	Rodney Wright		Fresno State	5-8	175	So. WR	Dwight Carter		Hawaii		5-10	174	Sr.
TE	Brian Natkin		UTEP		6-4	245	Sr.
OL	Adrian Klemm		Hawaii		6-5	322	Sr.
OL	Kaulana Noa		Hawaii		6-5	317	Sr.
OL	Neal Gray		Rice		6-3	275	Sr.
OL	David Bobo		TCU		6-5	285	Jr.
OL	Carey Clayton		UTEP		6-4	272	Jr.
QB	Billy Volek		Fresno State	6-2	210	Sr.
RB	LaDainian Timlinson	TCU		5-11	210	Jr.
RB	Paul Smith		UTEP		5-11	235	Sr.
DL	Alan Harper		Fresno State	6-2	275	So. DL	Luke Johnson		SMU		6-1	230	Sr.
DL	Aaron Schobel		TCU		6-4	246	Jr.
DL	Brian Young		UTEP		6-4	274	Sr.
LB	Orlando Huff		Fresno State	6-3	220	Jr.
LB	Jeff Ulbrich		Hawaii		6-1	243	Sr.
LB	Jason Simonton		SMU		5-11	225	Sr.
DB	Anthony Limbrick	Fresno State	6-1	195	Jr.
DB	Qunicy LeJay		Hawaii		5-9	183	Sr.
DB	Tracy Hart		SMU		5-11	195	Sr.
DB	Todd Franz		Tulsa		6-1	190	Sr.
PK	Jeff Hanna 		Fresno State	6-1	196	Sr.
P	Tim Morgan		San Jose State	6-6	213	Sr.
ST	Jamal Garland		Hawaii		5-10	174	So. ST	Chris Cunningham	SMU		5-8	175	Fr. Offense - Wide receivers: Steven Pulley, San Jose State, Sr.; Lee Mays, UTEP, So. ; Damon Savage, Tulsa, Sr. Linemen: Rob Gatrell, Fresno State, Sr.; Chris Fe'esago, San Jose State, So. ; Austin Adami, SMU, Sr.; Mike Keathley, TCU, Jr.; Jeff Millican, TCU, Jr. Quarterback: Dan Robinson, Hawaii, Sr. Running backs: John Mosley, Tulsa, Sr.; Deonce Whitaker, San Jose State, Jr.
Defense - Linemen: Matt Paul, Hawaii, Sr.; London Dunlap, TCU, Sr.; Shawn Worthen, TCU, Jr. Linebackers: Tim Skipper, Fresno State, Jr.; Shannon Brazzell, TCU, Jr.; Robert Weathers, UTEP, Sr.; Ashon Farley, Tulsa, Jr. Secondary: Jason Hebert, Rice, So. ; Curtis Fuller, TCU, Jr.; Reggie Hunt, TCU, Sr.; Derek Walker, UTEP, Jr. Specialists - PK: Ricky Bishop, UTEP, Jr.; P: Chad Shrout, Hawaii, Sr. ST: Charles Smith, Fresno State, So.